It's always exciting when one of our blogging friends publishes a cookbook. I couldn't be more thrilled for my friend, Sid of Sid's Sea Palm Cooking. Sid contacted me and asked if I would join in a Virtual Tapas Party as a way to promote her new project. I was happy to help. Sid sent me out an autographed copy of this wonderful compilation of Appetizers, Canapes and Finger Foods. She also offered me a second cookbook to offer to my readers in a giveaway. I jumped on that offer too. One of my lucky readers is going to be very happy. Not to worry though. Even if you don't win it is easy to order up this fun cookbook through Amazon. You will be glad that you did. The recipes are well written, easy to follow and use simple, every day ingredients. I would recommend this book even if it weren't written by a friend. All of my comments and opinions are completely and honestly my own. As soon as this book arrived I sat down and started thumbing through it. Sid explained how much they enjoy having friends over and have found the best way to entertain is with small plates. She then goes on to share a LOT of recipes. This party wasn't scheduled until today but I couldn't wait to start trying out Sid's ideas. We had a Fish Friday Foodies event coming up and the theme was Picnic Fare. I adapted Sid's Shrimp and Crab Mini Quiche recipe and made Seafood Mini Quiches for a pool party that I attended and a full size Quiche to take to our church picnic. They were a huge hit at each gathering. When I posted the recipe on my blog, my son, Chuck, who lives in VA, made the recipe to take to a gathering at work and his coworkers were blown away. I adapted this recipe that I'm sharing today, as well. My husband is spice sensitive so I used a sweet chili sauce instead of a sweet hot chile sauce. The recipe called for Blackberry Jelly. Our son, Tony, creates jams. I have a whole shelf in my cupboard filled with delicious jams that he provides. There was not a Blackberry to be found but I did find this amazing Blueberry jam. Instead of a Thai Chili Pepper, I added this hot pepper that came from our daughter, Nicole's, garden. She wasn't sure what kind it is. It looks like perhaps a ghost chili? What do you think? It was too hot to turn on the oven so I used the grill. I cooked the wings over indirect heat until they were cooked through. Then I lowered the flames on the other side of the grill and finished them over direct heat with the sauce. Oh, and I increased the recipe because I was feeding a crowd. I served these up to the kids when they came over to celebrate my birthday. They were completely wowed by them. My daughter, Amy, and her guy, Doug, are wing aficionados. Doug grabbed the first wing and said "These are the best wings ever". Amy replied "he says that about everything" and then she tried one. "These are the best wings ever", she exclaimed. Music to a cook's ears. Thanks Sid!! Here are the links to the other participants bringing recipes to this party. You will find the entry form for the raffle right underneath my recipe. Good luck!! I am also sharing this post over at Foodies Read...stop by and see what the others are reading in September. Separate wings into three pieces at the joints. Discard tips or save for stock. Heat a grill for indirect heat, turning the flames on high for half the grill. Toss the wing pieces in olive oil and place on the other half of the grill. Close the lid and allow to cook for about an hour, turning every 15 minutes, until the fat is rendered and they are cooked through. Meanwhile, place the Hoisin Sauce, Sweet Chili Sauce, Sesame Oil, Asian Dressing, Jam, honey and pepper into a saucepan over med high heat. Stir to combine and cook until heated through. Set aside. Turn the flames to med high heat on the grill. Move the wings from the indirect heat onto the flames and baste with the sauce. Let cook, covered for about 5 minutes, flip and brush bottoms with the sauce. Let cook for another 3 or 4 minutes, Flip again and cook for a minute or two until the sauce is adhered and the wings are crisp and browned. Remove to a platter and sprinkle with scallions and sesame seeds. Recipe adapted from Nibbles and Bites by Sidsel McOmie. Thanks so much for coming to the party, it was such a pleasure to have you here. And you made my Sweet and Spicy wings too. And made them your own as well. That's the best part of cooking, putting your own spin to a recipe. And I may just have to try these out of the grill the next time I make them. Thanks for including me Sid. I loved it. 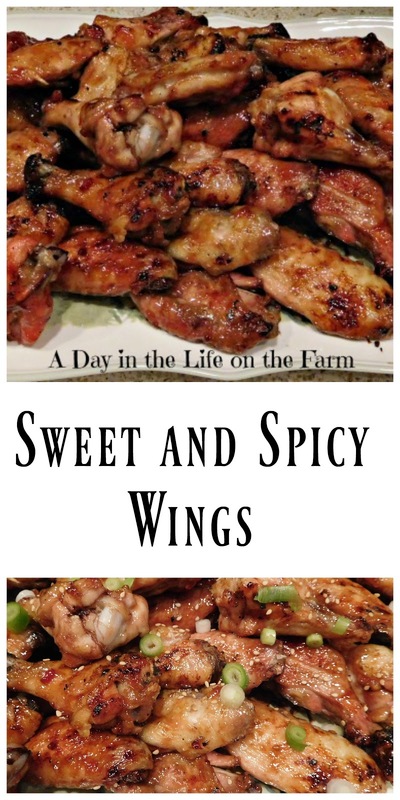 We love love love wings and these look like a great way to enjoy them. We'll have to make them this football season! I'd have a really hard time sharing these wings Wendy. They look delicious! Pinned! That's why you need to make a double batch. Oh wow...these do sound so stinkin' yummy...and I love that you made them your own with what ingredients you had on hand! And, I'm totally jealous of that jam shelf...I only have a piece of shelf...I'll have to get on that! Our son keeps us well supplied. I love a good cheese board! One of my favorites too Cam. I consider making those.... they look amazing!!!!! Oh then you will love this cookbook Ali...it is chock full of recipes that will pair perfectly with your sangria. That sounds like a delicious way to cook chicken -- whether wings or other parts. As you say, great flavor profile. Those wings look so good! Our family loves tapas!! They were good Terri. Good luck in the raffle. I love a nice plate of grilled spicy squid. Squid is always delicious Tina. Thanks for stopping by. I'm from Buffalo so wings are pretty sacred around here - these look yummy! My favorite tapas is gambas al ajillo (garlic shrimp) which I learned about from a cooking friend from the old Recipezaar who was from Minnesota but married a guy from the Canary Islands (and now lives in that paradise!). We shared a lot of similar food loves. I have been working on a thai chili sauce from scratch- will let you know when I post it so you can adjust what ingredients you want, in your case peppers, in mine it was sugar...that pepper is definitely NOT a ghostie considering that is one of the hottest in the world right now and if you had it you would know it. We'd been shopping for pepper plants from a specialty grower in the spring. It is mind boggling how many different kinds there are so it is really hard to tell. But not too hot as you can see the bottom is rounded like a bell peppers. Usually if they are super hot the bottom is pointed like a scorpion, or else they have that unique flattened shape like a scotch bonnet. The wings sound delicious! I will have to try them and see what kind of sf jam I have or else make it from scratch. Not too hard since I usually just do a jar at a time. I used to can more but ended up with too many jars and would give most of it away, which is fine but most people want the regular and not sugar free. You know how it is. Thanks for the tip on the peppers and how to differentiate the heat factor. That is important in this household as Frank is heat intolerant. My favorite appetizer is anything with brie! These wings do look delicious! I love Brie too Ellen. Just seeing this post now, Wendy! Those wings look amazing- love the blueberry jam in there! How wonderful for Sid- I bet her recipes are wonderful! They sure are...sorry you missed the raffle. These sound fabulous Wendy; can't wait to try some! Sounds like you get lots of family food contributions. I sure do Claudia. I am very blessed.